My brass banding started back in January 1978 at the tender age of 9. I only wanted to 'have a go'; just because my big brother had joined. 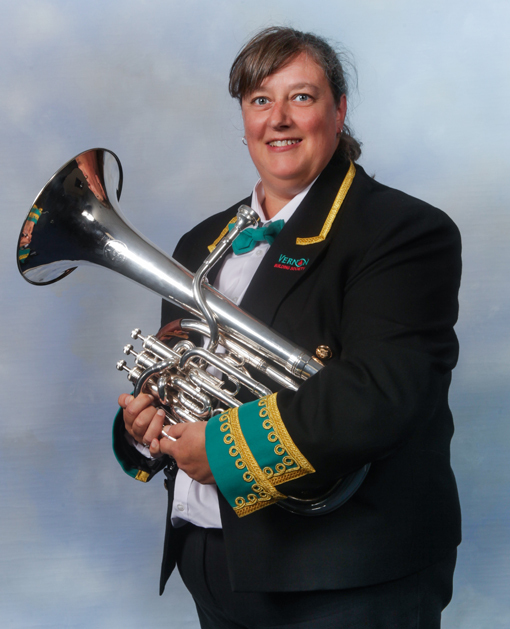 I joined New Mills Brass Band and learned to play a Soprano Cornet (it was all they had free!) taught by the late Bernard Webb. At the age of 13 I switched to Baritone and have stayed there ever since, with odd spells on Horn and Euphonium if an empty chair needed filling. I stayed with New Mills until Dec 2007, but went back to help many times, especially with the 200th Birthday celebrations in 2012.In Aug 2008 I joined Whaley Bridge Band and spent an enjoyable 4 1/2 years with them. During this time I joined up to volunteer with Derbyshire Army Cadet Force and joined their military band. This was great fun and opened up lots of new doors, including playing at the Olympic Games in 2012. I have been a member of VBS Poynton band now since January 2014 and have also done lots of firsts with them. Playing in many contests and winning some of them. This gave me my first ever opportunity to play at the National Finals in 2016 in Cheltenham. With just over 40 years playing experience I am still learning something new and enjoying playing in such a friendly band.